Return All Robots! by Space Whale Studios is a new puzzle game available for the PC and XBLA. As an intern at a robotics company, you possess a remote control that can direct all automatons to head in your direction at the push of a button. Robots can only travel in the four cardinal directions, however, and will keep moving until they hit an obstacle. 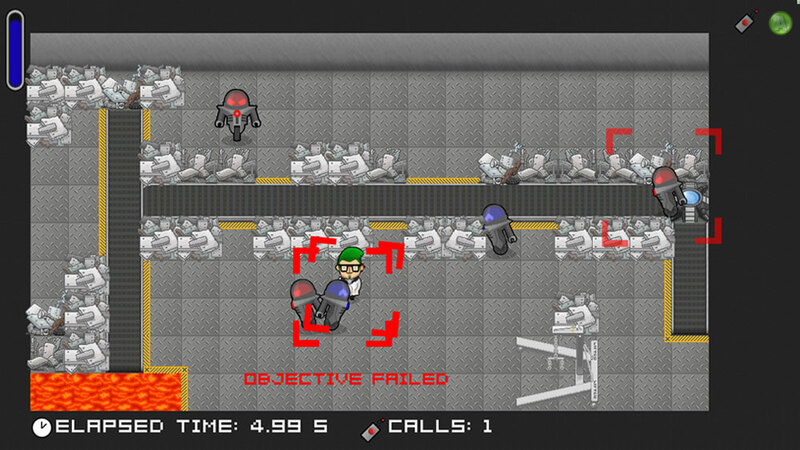 Due to an incident in the offices, your character possesses the only functional remote left, so it falls to the player to travel to the various labs of the building and manipulate the robots he finds into a series of teleporters in order to keep the company from losing all of its precious, precious robots (and, by extension, investors). The experience the game presents feels very familiar. Have you ever played a game with an ice level where you push a block of ice or something standing on a sheet of ice, and it goes sliding until it hits something? Well, this game consists entirely of puzzles based on that mechanic. True, RAR! does allow a player to move robots from anywhere on the screen and adds a measure of difficulty by making all robots move toward the player when the remote is used, but the basic “object will move until it hits an obstacle” mechanic lies at the heart of each puzzle. That isn’t to say it’s not done very well, though, and RAR! includes some devilish tricks to complicate things, such as bad robots, a “cyber-turtle” that serves as a portable obstacle, and melt-able ice blocks. For me, the stages tended to go by pretty fast, on average taking me a few minutes to complete, and I was able to wrap up the story mode of the game in a couple of hours. 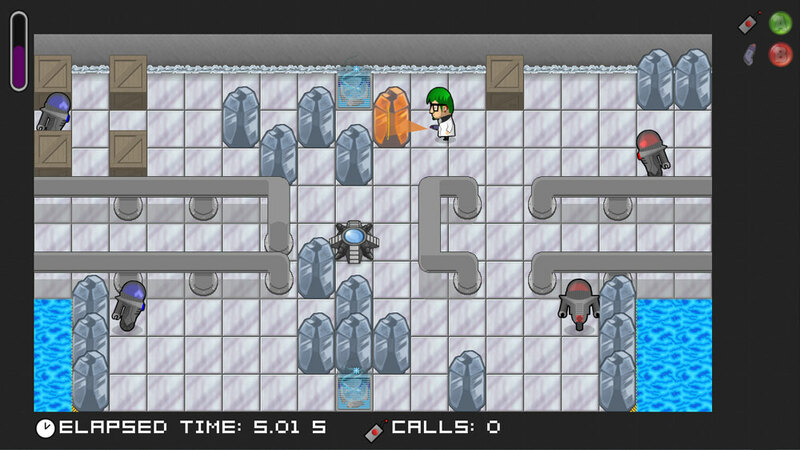 Once the player completes the story mode, new lab areas full of extra puzzles open up, expanding the gameplay experience. Unfortunately, I cannot really say by how much they expand the game, as I hit a puzzle I have not been able to solve for three damn days. The graphics of the game are crisp and bright, evocative of many online Flash games. Most importantly, the graphics are laid out in such a way that obstacles, hazards, and robots are clearly shown, and one can easily tell the path each robot will take once called. Custom artwork accompanies the end of each section of the lab, and the quality of these pictures is such that they serve as a pleasant (and often humorous) experience at these major plot points. The music, designed by the game’s lead designer, is also excellent, with the electronic/synth style fitting the technological setting of the game perfectly. In one of the best decisions ever, the game is designed so that the music does not start over upon failing a level (which can happen often), so the player avoids endlessly repeating the first ten to thirty seconds of a song, otherwise known as the most annoying musical experience EVER. It’s also worth noting that the soundtrack is available free through OCRemix, and it’s definitely worth checking out. The game is simple to control, but unfortunately the PC version of the game does not accept controller input. Using the arrow and a few letter keys on keyboard wasn’t a terrible experience, but I had the opportunity to try the game on an Xbox 360 controller, and RAR! works far better on the latter. My main complaint for the game is the lack of any hints or online help. I realize this is not necessarily the fault of the designers, but I found I didn’t much care to think about that during a fit of rage over the previously mentioned puzzle that has had me stuck for…ahem…three damn days. Despite searching extensively for a solution or hint, I quickly found that players of RAR! can pretty much expect to be on their own. (Actually I did find one hint about that particular puzzle: “Don’t think too much.” Thanks, buddy, you’re a huge help.) In the story mode of the game this isn’t so bad, as multiple stages are open at once, so if you’re stuck on something you can go try another level and come back to the one you’re stuck on later. In post-story mode play, however, the levels must be completed in series, so if you get stuck on a level you’re out of luck if you want to take a break from it and try something else. Overall, Return All Robots! is an excellent little puzzle game, and it shows great promise for its creators. Like many great games, it’s easy to learn but difficult to master, and the stylistic elements of the game do a lot to enhance the typical puzzle experience. Another plus is the fact that it’s priced at $3 for the PC version or 240 MS Points for the XBLA version, making this a great buy for the gamer on a budget. (Quick rant: XBLA, you need to get yourself a better pricing system. Saying something costs 240 imaginary points is pretty idiotic when you could just say it’s three freaking dollars.) And if anyone out there does get it and can figure out the “Firing Squad” stage, let me know. It’s driving me NUTS. It just makes me so happy to hear somebody else say that. Michael, could you not just ask the developer how to do it for the purposes of reviewing? He’s is extremely easy to contact online and I’m sure he’d just tell you how to do it if it makes a difference in the review. I know that’s kinda beside the point you’re making, but puzzle games are like that. It’s always something you get stuck on for a long time and you just find some little thing you didn’t think to do that makes it obvious. So Lost Vikings meets Bomberman? Dear Readers: Write For Me, Part 2: Paul in a Bikini!